He starts out with a Chub mod. Then quickly builds a neat frame of his own. ﻿Then he starts building a group of his own frames combined with Chub mods. After that he tries a few of Malcom Craig's designs on for size. He shifts to a frame based on some of Zizy's work. 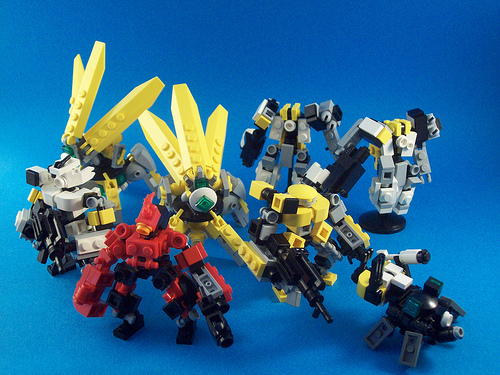 Then makes a detour to creat a frame after an offhand remark by me on the MFZ IRC channel. Then he builds a bunch of scenery. And yet something else completely different. ...Or is it something more? This has been sitting on my coffee table for a while. It started out as part of a spaceship, but that got dismantled pretty quickly. I want to try to figure out how to hide some sort of weaponry inside the "petals". I figure this is a decent way of sharing things that may be half built, rather than posting to, then deleting, things from Flickr. As I've said before, you never know what will attract people's interest. Let's show an example of that by listing the top twenty visited galleries in my Mechaton brickshelf gallery. So it goes to show that you never can anticipate what other people find interesting. 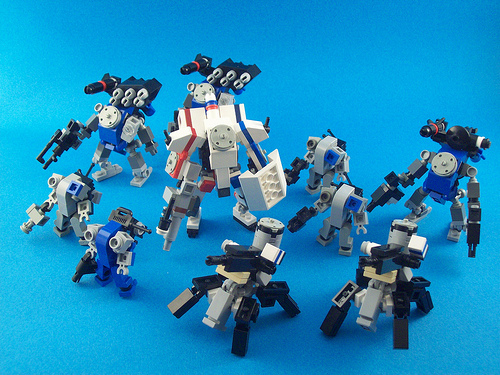 One of the few bits of background I've developed for my home games of MFZ is a company called Stevens Technology. 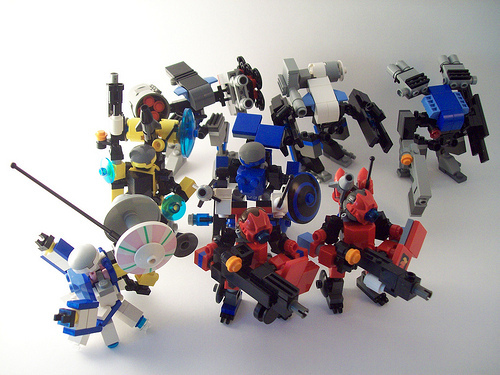 These are the mecha designs that have come from that line of thought. STMP-0: This is the Stevens Technology Multipurpose Platform. 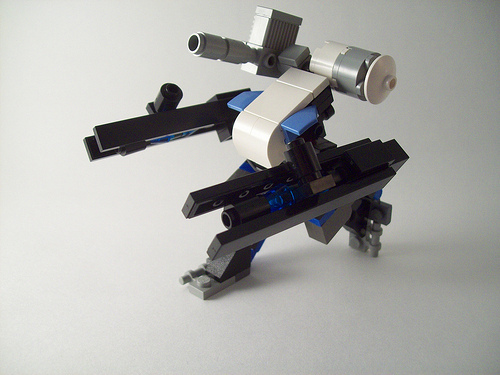 Designed with a low center of gravity and multiple manipulator arms, this is a sturdy and reliable unit. 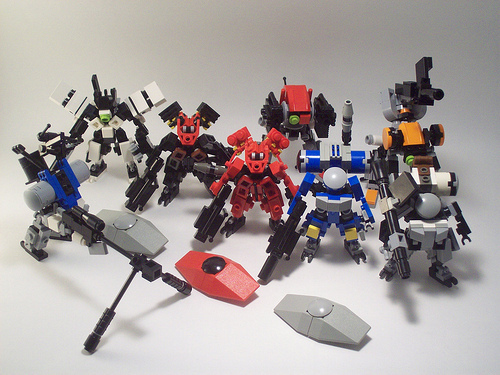 It is a civilian model and the starting point for most Stevens Technology mecha. 2d6+1d8 Red dice at HtH Range (Manipulator Arms). STMP-1: The STMP-1 is a modification of the civilian Multipurpose Platform and the first military offering from Stevens Technology. 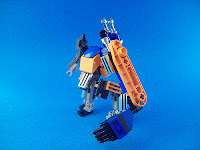 The low profile has been found to provide a stable platform for the two weapon arms, one Dual Mortar and one Twin Cannon, that simply replaced the STMP-0 manipulator arms. 2d6+1d8 Red dice at Direct Fire Range (Left Twin Cannon Arm). 2d6+1d8 Red dice at Artillery Range (Right Dual Mortar Arm). STMP-2: This model of the ST Military Platform is the second unit off the production line. Designed for moving from ranged to close combat, it replaced the two long-range guns of the STMP-1 with heavy duty manipulator units. 2d6 Red dice at HtH Range (Manipulator Arm). 2d6+1d8 Red dice at Direct Fire Range (Twin Cannon Arm). 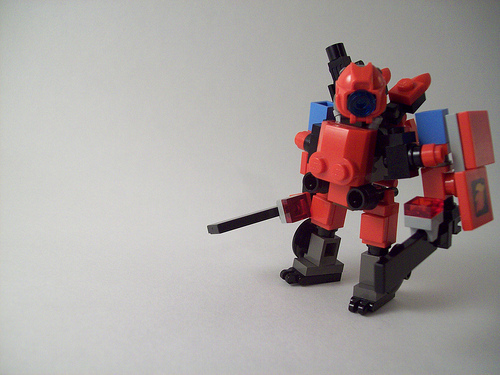 STMP-3: The third and most advanced -- at the time -- of the MP frames. The STMP-3 is adapted for microgravity, null atmosphere environments, and orbital combat. 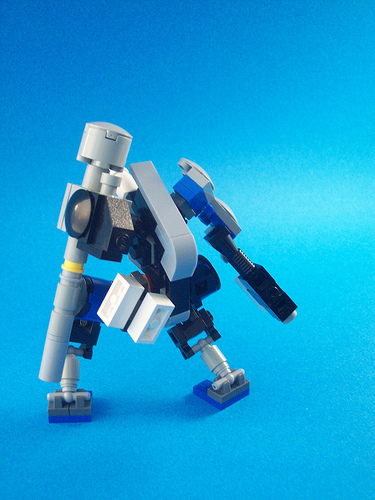 This model is equipped with a Manipulator Arm and Recoilless Rifle. It is also available in an unarmed configuration, adaptable to whatever format the purchaser might require. 2d6 Red dice at Direct Fire Range (Recoilless Rifle Arm). STMP-4: The latest offering from Stevens Technology, this is the first to feature an energy weapon and a jump jet. 1d6 Green die (Jump Jet). 2d6+1d8 Red dice (Right Las Gun and Left Cannon). * -- You're probably wondering why this guy has three White dice. The "third" is actually a Space Environment attachment. The icon for the White die is the best way to represent it. The STMP-1 was actually the first one I created in this line. I believe the STMP-0 was third, after the STMP-2. The initials STMP were derived from the the word "stumpy".